Final engineering for the difficult I-90 light-rail crossing requires as much as $20 million in added costs, to cover added research and “inefficiencies” in the work flow. Before the first tracks are installed, Sound Transit must spend as much as $20 million in unexpected engineering costs to finish designing the world’s only rail corridor over a floating bridge, as it extends service to the Eastside. Ron Lewis, project director for East Link, shared the blame between his own team and engineering giant Parsons Brinckerhoff (PB). The company could now earn $56 million instead of its earlier $36 million contract figure, which began at $28 million in 2012. Along with what Lewis called “inefficiencies” in the workflow, the cost increase will pay for deeper research than managers envisioned. Lewis and PB said they are learning as they go along in designing this unique crossing. Lewis said PB will be “held accountable” and made to justify any of the extra compensation. He called the $20 million change a contingency, which won’t necessarily all be used. The signature feature is the set of eight custom joints called track bridges, which must be installed on Interstate 90 to withstand wind, waves, and 2 feet of seasonal fluctuation in Lake Washington’s level. These are flexing sections spanning the area between fixed rails. Not only that, both the track bridges must accommodate six types of movement, like an airplane, while a four-car light-rail train rolls over them. Transit-board members vented their disappointment, yet unanimously approved the cost increase July 23, saying preparation now reduces risks down the road. Sound Transit’s final I-90 design, to be approved by the Washington State Department of Transportation (WSDOT), is expected to stretch another year, until late 2016. Passenger service between International District/Chinatown Station, Bellevue and Overlake, as frequent as 8 minutes between trains, is to begin in mid-2023. Voters approved the $3.7 billion East Link line and a sales-tax increase in a regional ballot measure in 2008. 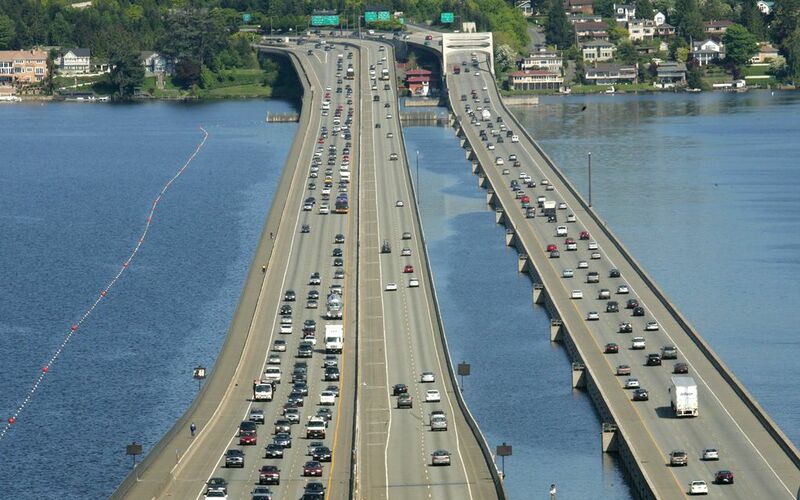 Even before then, experts identified the I-90 joints as a tricky feature. If a train were to derail, it could sink 200 feet to the silty lake bottom. Other concerns are mundane, such as how much gravel ballast must be removed or shifted, to offset the weight of concrete railroad ties. With stakes so high, the engineering is done at a deliberate pace. Of 23 issues posed by a WSDOT technical group in 2008, the Sound Transit/PB team reports solving 15 of them, with five still under study, and three to be tackled later. Lewis said there’s been frequent turnover at PB — some at his request. Sometimes engineers got ahead of themselves, and now must rework their analyses. Sound Transit’s own staff were told to “stand down” in February on certain issues, he said, until more urgent tasks are finished. “In some cases, we were unable to provide timely design direction, and as a result, that contributed to some of the spin cycles,” Lewis acknowledged at the board’s capital committee. One remaining technical question is how trains would operate during a substantial, once-a-year type windstorm. Assuming a sustained north wind, at 30 to 40 mph, it appears only one train at a time could safely occupy the bridge. Also, lab tests are being added, at the University of Washington, to measure how train vibrations will be transmitted to the bridge deck. The steel tracks will sit on concrete ties, which Sound Transit thinks can be fastened to the deck with epoxy, rather than by drilling holes in the bridge, said John Sleavin, deputy East Link director. More research will consider how to improve Mount Baker tunnels for fire safety. This applies not only for trains, but car traffic, because road shoulders will be replaced by added bus-carpool lanes. Rescues will be more difficult. WSDOT is starting to replace lights, ventilation and fire equipment. “The $20 million is, shall we say, a final attempt to solve some issues that are bothering them,” said Claus Jensen, a Mercer Island resident who wrote to WSDOT Secretary Lynn Peterson two years ago about fire hazards. • The bridge pontoons can withstand train traffic without reducing the 100-year design life of the bridge, built in 1989. • Tests of the track bridges in Pueblo, Colo., using real trains in 2013, proved Link can run safely at 55 mph on the bridge. Earlier, there was a question about whether reduced speeds might be necessary. • Tracks are being revised to improve passenger comfort, when trains descend from the shore to lake level. • Crews will not need to scrape pavement from the freeway, and substitute lighter materials, to compensate for the weight of trains. 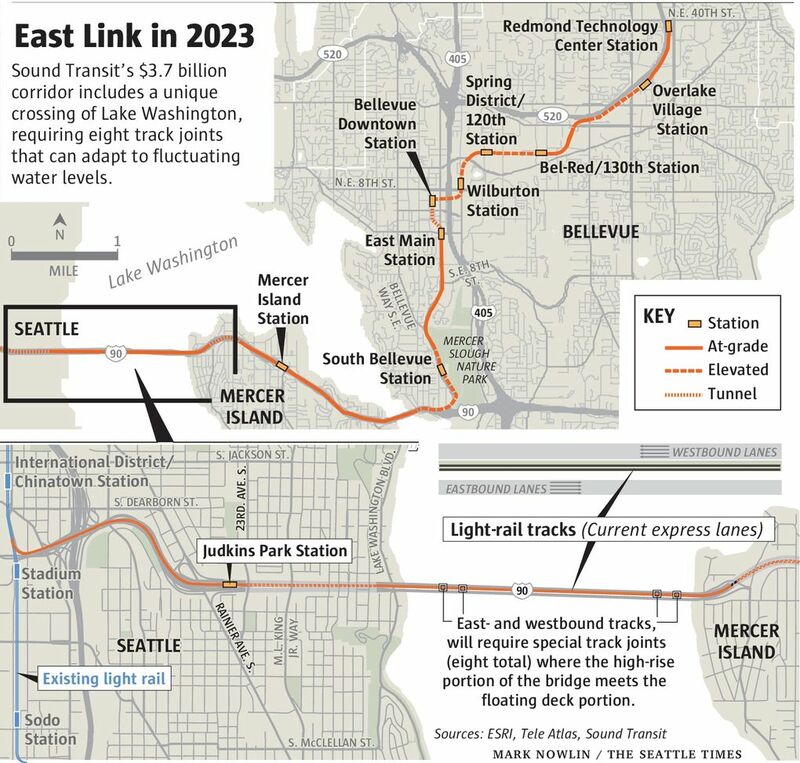 Also, designs are being added for a temporary train-storage track on the Seattle side, and for bus connections at Mercer Island Station. Engineering delays will not hinder I-90 rail construction, now anticipated to begin in 2017, Lewis said. Sound Transit can’t take over the current express lanes until WSDOT finishes adding carpool lanes to the main freeway, a $188 million project. Nor would another $20 million threaten the East Link budget, Lewis said, because the agency has $97 million in unspent engineering money. PB has contracts with Sound Transit worth tens of millions of dollars, including the plans for light-rail networks in the 1996, 2008 and pending 2016 ballot measures. The firm wrote preliminary designs for the Highway 99 tunnel, and devised a speedy replacement for a broken I-5 Skagit River Bridge span in mid-2013. Nationally, the firm designed New York City’s first subway lines and more recently, partnered in the Boston Big Dig.